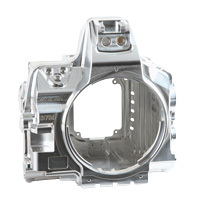 The aluminum material used in MDX series housings makes it possible to manufacture a body that is both lightweight and strong. The all-new high-rigidity, high-durability, high-precision MDX series demonstrates the highest levels of performance under a variety of shooting conditions. Designed for easy operation so you can comfortably reach the main command dial and sub-command dial with your fingers, while keeping your hands on the grips. Delicate operations are possible even while you are looking through the viewfinder. You can change the shutter speed or aperture value effortlessly while maintaining your framing. *The Ergo Grip22109 (option) is mounted. The YS converter connector is standard equipment. The included 5-pin wired connector accepts the optional YS Converter/N. 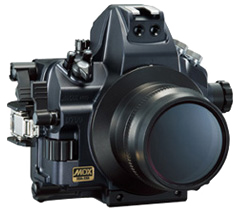 The converter woks with the YS-Series strobes to provide automatic TTL flash adjustment. The housing is protected by a highly corrosion resistant, anodized (dark blue) coating. The coating protects the housing from environmental corrosion and abrasions.